From David Bowie to neo nazis, Henry Rollins lends his mind out to the crowd in his latest stint of European tours as Getintothis’ JoeRayW reports. 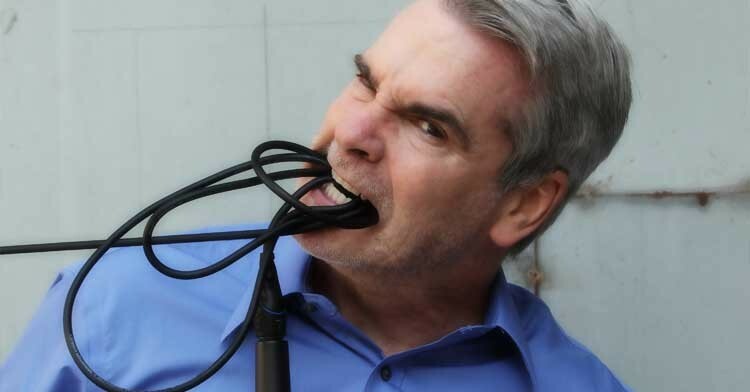 Henry Rollins is more of a talker than singer these days. In fact, the only time you’ll catch him using his vocal chords for choruses is through guest appearances, such as at a recent Dinosaur Jr show. Since Rollins Band came to an end, he tends to take just himself and a microphone on the road, and on stage all he has are words, and words are all he needs. The topics discussed at this recent Manchester show aren’t too dissimilar to the things he sang about in the days of Black Flag, with it all boiling down to people, places, penguins and politics. Sure you switch out the penguin for a rat, but it’s all the same, only without drums and guitar each word matters, as there is nothing else to focus on. Going out to speak to a crowd for two hours about topics you find interesting is certainly no mean feat. Hell, we couldn’t even read a poem out to a small crowd without choking on our own saliva! There is a negative perception of non fiction speaking when it isn’t a political debate or a cult. You need interesting stories, charisma, and a way to blast it out so everyone can take your words, and push them into their thoughts. Rollins has all that; it’s why he’s been a go to for narrative segments in albums (check out The Flaming Lips version of Pink Floyd’s Dark Side of the Moon), and playing Neo-Nazis on television for years! Why isn’t Rollins just getting the old band back together and blasting out his self deprecating, self relating punk rock? Because, Henry Rollins as a vocalist can deliver his message on all fronts, be it through music or without. The cult of Henry Rollins is already in place, you can see it in the turn out, you can see their passion burning for the guy who is smaller than you think. Though still not small enough to come out pretty in a brawl. Rollins didn’t shut his mouth for the whole two hours, he kept on talking and the crowd kept on listening. Topics would veer from lunch with David Bowie to sleeping out in the Antarctic blasting out the Stooges’ Raw Power, and each story was connected through his love of that record. Without Raw Power would Rollins have joined Black Flag? Without that record would he have took that jump and made a name for himself, involving himself in music, writing, film, television and radio? The main thing to take away from his stories is that music can make your life, it can push you, it can fulfil you. He even offered up a story of Manchester, and how a brawl nearly erupted due to the band headlining the show instead of Chelsea, who were settling for support. It all ended in spit, much like most shows back during the punk explosion (we weren’t there, but the book Punk Rock: An Oral History by John Robb tells a good story), and it shows how many stories he has tucked away in the archives of his brain. Rollins has as much power in his speaking as he does in his screaming, and even if he involved himself in projects such as the cheery Christmas movie Jack Frost, much to the dismay of many Black Flag fans at the time, he went out and did it because he had the opportunity, and had humorous, passionate and invigorating stories to tell of these experiences. He didn’t flex his muscles and gloat about his achievements, he pulled us all in and gave us the impression that we could find something in this dirty, greed driven world. The most powerful stories were those of his friend Lemmy, who sadly lost the battle to cancer at the beginning of the year, and he told us all how he was inspired, how the two met and quickly became friends who would act like freaks in Lemmy’s apartment, listening to a punk rock tape. The stories provided an insight into the life of a legend, and humanised him in a way that can only be told by someone who was part of his life. It’s funny, touching, and Rollins doesn’t let the sadness take over, but you can see it in his eyes, in the slight momentary change in his voice. Some of the stories have been told before, we’ve stumbled across a few ourself browsing the web for his work, but it’s only akin to going to a show and seeing the same hits played out. It’s still great to hear them direct to your skull, and new details pop up, which offers new insights into the world of a maniac. It all comes back to music, and the vocal performance can only be seen as a continuation of his past work. Rollins has dabbled in spoken word as far back as Black Flag, with the album Family Man telling hard hitting fiction to those who weren’t disgusted by the sudden shift in style. His vocal chords are still a weapon, fighting the likes of Donald Trump and everything else that is wrong with the world. It’s his optimism for everything right that makes his live show so worthwhile though, and even if his life leans more towards scuba diving then stage diving, there is still a punk within him.